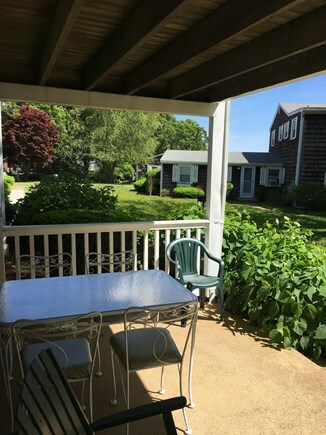 Walk just about everywhere in Vineyard Haven! 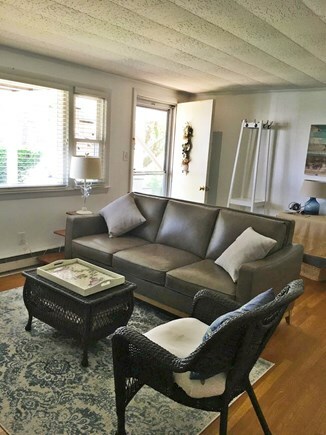 Our cozy 2 bedroom, 1 bath, downstairs condo is just a few blocks from the VH ferry landing, beach, Main Street shops, restaurants, and more. 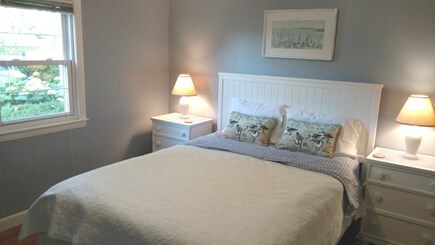 You'll be close to public transportation, the VH Ferry, Stop and Shop, The Blackdog Restaurant and many other amenities. 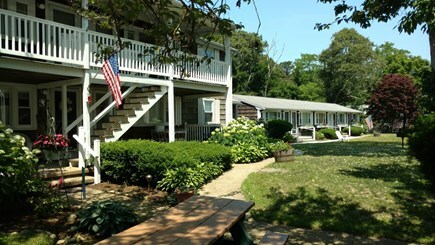 Come enjoy the beautiful Martha's Vineyard beaches and all the area has to offer! 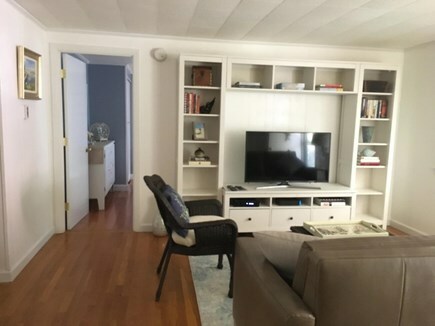 This rental is a 725sf lower-unit condo (on the ground floor of a two-story building), newly-painted and freshened up. It has its own entrance and one parking spot. Just steps away from parking, enter the unit from the furnished patio which is perfect for relaxing or dining. After your journey to the island, drop your keys, stash your stuff and enjoy the living room with a comfy couch, wireless internet & Smart TV. If you have your own Netflix subscription (or other streaming services) you can enjoy your favorite movies. 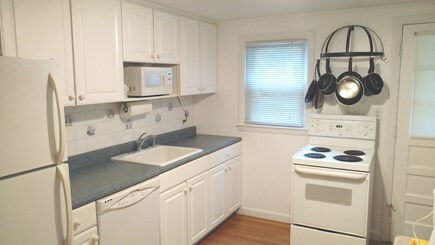 The kitchen is equipped for any cooking you might want to do. It includes a fridge/freezer, stove, microwave, coffee maker, blender, and more. There's always a bit of food in the pantry, enough for a short while 'till you can get to the grocery store. And of course there's coffee, tea and sugar. 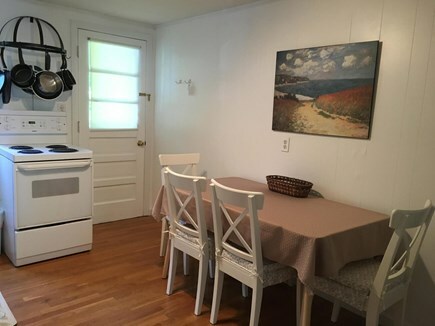 The kitchen includes a dishwasher. You’ll have access to a community charcoal grill or our private gas grill. The two bedrooms have generous storage, comfy beds to sleep up to four and each bedroom has a window air conditioning unit. (There's no central AC but if needed during a hot spell, fans can be used to get cold air moving around). 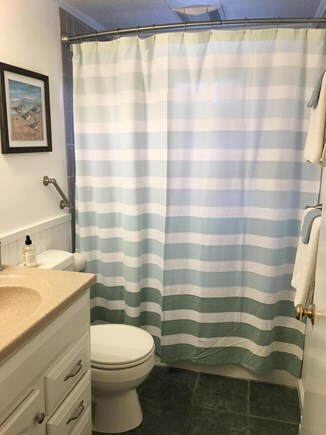 The bathroom has both a shower/tub unit, is stocked with fresh towels, and if needed some toiletries too. 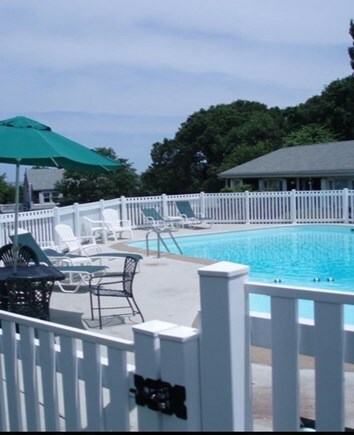 You have complete access to the sparkling pool for fun and relaxation. Please do not invite friends to the pool as only people on the lease agreement are allowed. We supply four beach towels and one beach blanket. You have full access to the laundry room on the premises, including supplies, just steps away from the unit. Check-in time is at 3:00pm and before 10:00pm. We need to know exactly how many- and- who is spending the night in our unit. 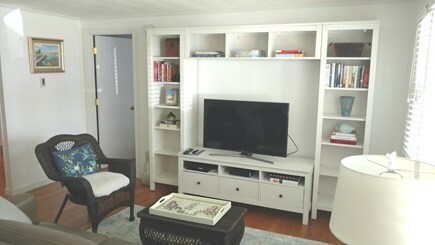 We limit rental to only four persons, though an infant may be OK if you ask. Just communicate with us who is coming. Check out time is 11:00am. If possible, we like to greet all guests at check-in to get you going on the wi-fi, TV, etc. 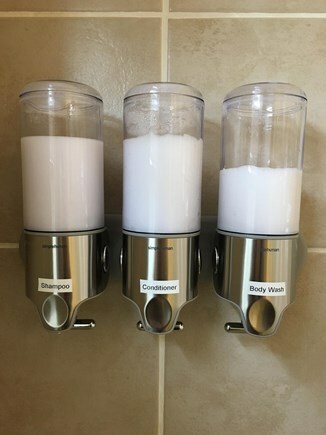 We want you to get comfortable and enjoy your stay! We do not permit Parties, pets, smoking or vaping. Please NO PARTIES - this is a family-oriented community, and we have neighbors we respect and like a lot! They don't like loud guests and have in the past called the authorities. Additional pricing info: Cleaning fee $100. Security deposit required, State and local taxes of 11.7% will apply.